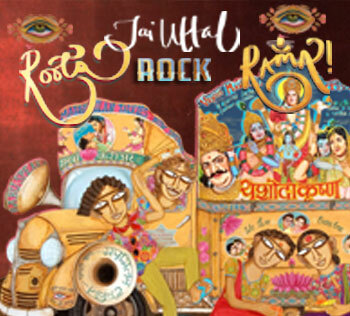 The title Roots, Rock, Rama! is a play on the name of the Bob Marley song “Roots, Rock, Reggae.” Marley is one of Jai’s key musical influences, and the first disc of his new album is deeply steeped in reggae’s earthy rhythms, hypnotic bass lines, jubilant horn charts and soulful vocal harmonies. Jai calls this disc the “Rama Sun” CD. The second CD, known as “Rama Moon,” evokes an entirely different mood. Grounded in the gentle, lilting sway of Brazilian samba, it also touches on the pastoral splendor of the more acoustic tracks from the Beatles’ White Album. The Beatles are another major influence, and Jai has brought their pioneering fusion of Indian music and Western pop into the 21st century. The more upbeat “Rama Sun” songs were recorded live-in-the-studio in L.A. by Jai and his longtime backing band, anchored by drummer Dave Allen, bassist Mark Gorman and guitarist Steve Postell (David Crosby, Jennifer Warnes, John Oates, Dave Koz, many more). The sessions skillfully capture the deep musical empathy that developed among these exceptional musicians over the years. Clarion-call horn charts are contributed by Peter Apfelbaum and Jeff Cressman (Santana, Don Cherry, Trey Anastasio, Charlie Hunter, Tito Puente, Shelia E, Joshua Redman, others), two veterans of Jai’s groundbreaking Pagan Love Orchestra who have also played roles on more recent Jai Uttal albums such as Thunder Love and Queen of Hearts. Another frequent collaborator, vibrant singer Tina Malia (Kenny Loggins, India.Arie, Bonnie Raitt, Bassnectar, Deva Premal and Miten, Omar Faruk Tekbilek, Peter Yarrow, and more), forms part of an angelic backing vocal choir that also includes Prajna Vieira, Gaura Vani and Sandy Cressman. Together, they bring a joyous, gospel feel to kirtan’s call-and-response vocalizing. One more instrumental color, heard on tracks such as “H.A.R.I. (Hari Awakens Radha’s Incandescence)” is the Bollywood magic of the Melodious Strings of Mumbai, led by cellist Jake Charkey. Thanks to modern digital technology, they were able to contribute their parts without leaving India, where they are based. Jai’s love affair with Brazilian music forms the buoyant, opulent basis for CD 2, “Rama Moon.” He first delved into Brazil’s rich rhythmic and melodic legacy on his 2009 album Thunder Love. But here those influences flourish in more subdued, sepia-toned moods. Three of the tracks were produced by his friend, the Brazilian-born guitarist Jose Neto (Harry Belafonte, Hugh Masekela, George Benson, Steve Winwood). Brazilian percussionist Caf da Silva (Steve Winwood, Gilberto Gil, David Byrne, James Taylor, Stevie Wonder, Srgio Mendes, Roberta Flack, David Byrne, Harry Belafonte, Mick Jagger, Ashford & Simpson with Maya Angelou, Astrud Gilberto, Dianne Reeves and many more) brings his own brand of rhythmic finesse to songs on this disc. On tracks like “Saudades de Radha” and “S.R.I. (Supersonic Rescue Intervention) R.A.M. (Radiant Atomic Mantra),” the gentle cadences of samba and other Brazilian beats bring out some of some of the most gorgeously melodic songwriting to be found anywhere in Jai’s vast catalog. It all adds up to a two-CD album that’s vast in scope and deeply rooted in the ardor of devotion. Each of the discs can stand on its own, yet each one colors the other in subtle ways—a complete and elegantly balanced yin/yang experience.